I offer a range of workshops from the traditional sitting and movement practice, to the more exploratory focused on creativity and awareness. They range from beginner level to deeper study. Irrespective of your creative inclinations, time availability and budget, you should find a workshop suited to you. Spring is a time of renewal and growth, so why not take some time to nourish your well-being and creativity? Join a small, supportive and friendly group led by Ignacio Lalanne, a mindfulness teacher and practising artist. Together we are going to explore the extraordinary power found in observing and being aware of the present moment. The course is for anyone who wants to discover new sources of resilience, joy and calm in their life. Or simply want to cope better with stress, anxiety, fear or depression. There are limited places so signing up early is recommended. Your well being and contentment can be nourished. The ancient practice of mindfulness teaches us this. Modern psychology research also shows us how the mindfulness practice of being in the present moment can reduce stress and anxiety. Together, we are going to explore how to boost your happiness and well-being. You will learn the foundational skills of mindfulness, compassion, and meditation, and how to apply them in your life in a way that really makes a difference. This 8-week course is taught in a small, supportive and friendly group setting by Heatherleys staff member Ignacio Lalanne. It is part of his accreditation to become a certified Breathworks mindfulness teacher and is therefore offered to you for free. The course is for anyone who want to find new sources of resilience, joy, and calm in their life. Or just simply want to cope better with stress, anxiety, fear or depression. I have partnered with the marvelous Montse, owner and manager of Casa Ibero, a farmhouse high in the Alpujarra mountains of Southern Spain. On June 4th to 8th, I will be doing daily mindfulness workshops for all residents. 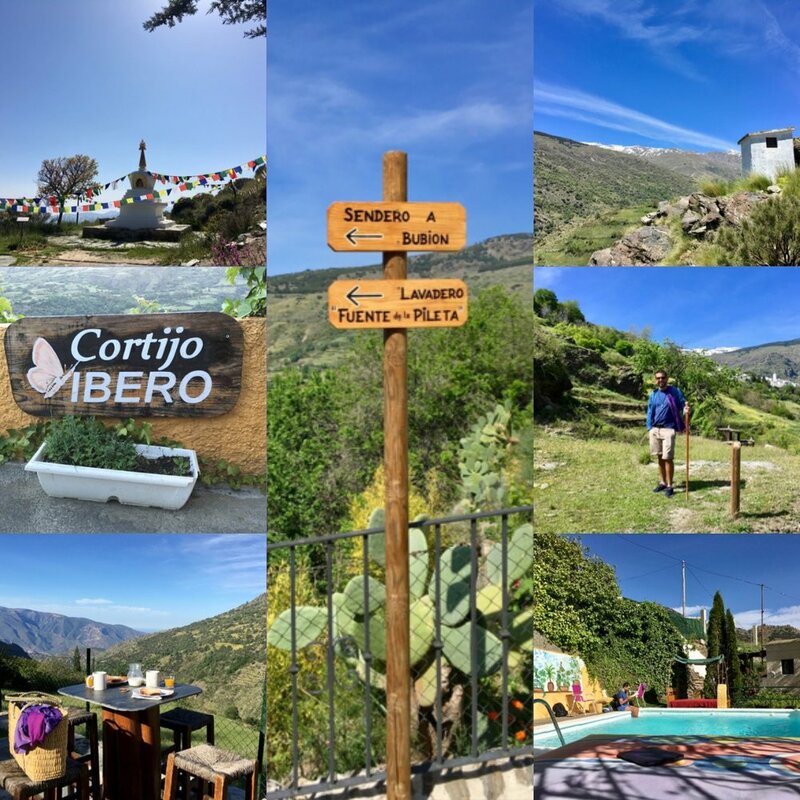 You can start your day joining me in a guided meditation surrounded by the beauty of the High Alpujarras, and take part in relaxed mindfulness activities in the local area. Casa Ibero is a farmhouse situated in the Alpujarras inside the Sierra Nevada National Park. It is 20 miles south of Granada (43 miles by car) and is part of the beautiful Andalusia region of Spain. The Alpujarras were the last stronghold of the Moors and are famed for excellent walking, food and spectacular scenery. The mountains are home to many picturesque Pueblos Blancos (white villages). Three of them within a 15 minute walk from Casa Ibero. From the Casa’s gardens and terraces, you can also see the top of the famous stupa at O.Sel.Ling retreat centre. To discover more about the Alpujarras Gerald Brenan’s classic “South from Granada” or Chris Stewart’s “Driving Over Lemons” are well worth a read.